The realm of Archaea provides a fantastic and colorful setting for the characters' adventures. Full of history, magic, fascinating people, and dark mysteries, the realm comes to life not only in the imagination of the players' minds but in the reality of the game. This chapter details some of the various aspects to the world that should be used by the Elder of the Realm to formulate adventures and by players to detail their character histories and to enrich their role-playing. Like the previous chapter, the material found in this section should be used to explore the realm of Archaea. However, without certain skills or Lores, much of this information should remain player knowledge and not character knowledge. The Elder of the Realm must carefully adjudicate what player-characters know and do not know. The age of the realm is unknown for its beginnings stretch into the mists of time. The distant past, beyond that of recorded history, mingles with myth and legend. Until the coming of the Sar, the Sovereign of the Realm, the history of the land can be taken only as partial truths. 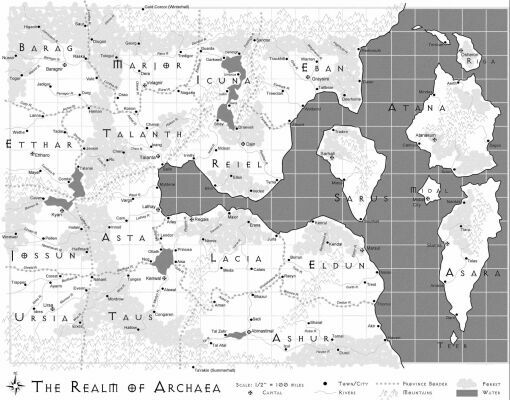 The complete 4,000 year history of the Realm can be found in the full version of the Archaea Sourcebook. Though each knows every age. Much of Archaea still remains wild and unexplored stretching nearly 2100 miles from east to west and 1500 miles from north to south. The Archaean Sea cuts into the mainland allowing for swift passage from place to place by way of water. The island of Sarus is the seat of the government of the Realm; the Crown resides in the capital city of Sarhall. Politically, the land is divided into individual provinces that swear fealty to the crown of the Sar, the Grand Sovereign of Archaea. For the most part, the provinces retain their own identities and govern themselves. There are twenty provinces. The provinces are divided into three groups: the central provinces, the western provinces, and the island provinces. Furthermore, with the new shifting of the Mists, new lands to the north, called the Winter Wastes, and to the south, called the Southern Wastes, have been revealed. Each province is a collection of smaller city-states and their territories are lorded over by a single capital city. All in all, the hierarchy of power starts with the Sar (or the Grand Sovereign), and the governing body at Sarhall, called the Council of Provinces (or the Council of the Realm), moves down to the Lord Sovereigns of the capitals of each province, down to the Lord Governors of each city-state, down to the Lord Mayors of each city-state's constituent towns. The Central Provinces are the original lands of the Realm. They were the first to be settled and named before the shifting of the Mists in 193 CE. On the first day of Highsummer in the year 193 CE, the Mists to the west of Marjor, Talanth, Asta, and Taus shifted revealing hundreds of miles of new land. Thousands of people from across the Realm flocked to the uncharted areas in hopes to claim territory for themselves. Eventually, the New Lands became the Western Provinces. On the third day of Firstspring, 1193 CE, with the return of the hero-mage Alatannin, the East Wall of the Mists shifted revealing more sea and a group of islands east of Sarus. With the assent of Sar Regenta XV, the islands were quickly declared provinces. Surprisingly, though few and far between, the Island Provinces were already settled by the descendants from the shipfuls of people of good taken into the Mists by Alatannin during the first Age of Heroes. In the stories of old, Alatannin left the Realm with ten ships of followers and adventurers. It is said that many of the great heroes of old sailed away with Alatannin. With the power of the Unraveling Stone, Alatannin parted the Mists and safely delivered the ten vessels beyond the East Wall. It is from these ancestors that the native people of the Island Provinces claim lineage. On the Thirtieth Day of Springsend in 2298 CE, the North Wall and South Wall of the Mists simultaneously shifted revealing vast new horizons and new peoples. To the north, beyond the Landsedge Mountains, lies the cruel snow and cold of the Northern Wastes-more commonly called the Winter Wastes. The Northern Wastes stretch as far as the eye can see and seem only an expansive blur of white. The Winter Wastes were thought to be lifeless until the first Winterkind crossed the mountains into Barag and Marjor. Nearly a head taller and a hand broader than the stoutest of Marjorans, the Winterkind are a proud, gruff, sturdy people with the superhuman ability to survive in the frozen Northern Wastes. Nomadic and curious, the Winterkind continue to cross into the Realm bringing the hides of winter beasts and weapons made of magical ice. Some say that the first Marjoran tribes were descendant from the Winterkind. To the south, beyond the Mist Mountains, lies another harsh landscape called the Southern Wastes--called the Tal'ahacaar by the Desert Ashuri meaning "the place of only death." The Southern Wastes are nothing more than flat, sand-scoured desert. As far as the eye can see, there is nothing but dun colored sand, dervishes of dust, the constant howl of windstorms, and the blistering heat of the sun. Akin to the Winter Wastes, life is miraculously sustained in the Southern Wastes. The Order of the Rain, the reclusive mistical organization found near Tal Atal and Izul, first discovered a stranger crossing the mountains into Ashur. With time, another and another and another traveler from the Southern Wastes arrived. Short, thin and sinewy, tightly muscled, and dark in complexion, the Foundlings are a curious people. Seemingly without family or community, individual Foundlings have made their way into the Realm with a collective yet far-too-simple reason, "To see what is there." Both Wastes prove to be too harsh and too inhospitable to most of the people of the Realm. Though short explorations have been made beyond the Landsedge and Mist Mountains, all have returned with little more than the description of the desolation found there. Furthermore, no more is known about the Winterkind and the Foundlings except for what has been explained by both groups themselves. Both the Northern and Southern Wastes are still greatly unexplored and unexplained and are surrounded by apprehension, superstition, and even fear. The Crown and the Council of the Realm have welcomed the people of both Wastes but have maintained an attitude of wariness. Most recently, the Northern and Southern Wastes have established small permanent settlements. Though called the first "cities" of these cruel lands, both are no larger than the tiny towns found in the remote parts of the rest of the Realm. Though seemingly out of character for the Winterkind and particularly the curious Foundlings, the cities grew out of the continued contact between the Wastes and the Realm. Brave and hardy Archaeans, finding ways to adapt, helped the Waste societies to see the need for a centralized settlement. The reigning Sar hopes to add the Winter Wastes and the Southern Wastes as new provinces. The Winterkind city is called Guld Corcor or Winterhall and is located north of Gaurg, Marjor through the Winterwind Pass. The best masons of the Baraki and Marjorans combined with the amazing power that the Winterkind possess over the cold, Winterhall was raised in stone and ice. Even in its humble beginnings, Guld Corcor recalls to mind the heavy walled cities of Baragnir and Volagnir. The Foundling city is called Ta'rakin, "the place of the first stone," or Summerhall. It is located southwest of Tal Atal, Ashur through the Flowing Sand Pass. Summerhall is described as tight collection of great tents and thick-clothed pavilions surrounded by a stone wall, whose height grows slowly every day to keep out the land's blasting sandstorms. Most of the Foundlings will investigate the novelty of the city and then move on. Therefore Summerhall is settled mostly by men and women from the "wet" and "peculiar" Realm. Though, as time passes, some of the Foundlings, particularly the young, are changing their ways and beginning to remain in the city for longer and longer periods of time. Since the reign of Sar Caval II and the organization of the Silver Guild, the monetary unit used throughout the Realm is the Crown. Crown pieces come in varied denominations ranging from quarter-crowns to hundred-crown pieces. To simulate money in the game, the Elder of the Realm may wish to use the money templates found in the back of the sourcebook and photocopy various Crown pieces on different colored cardstock. The paper money represents coined money. All game money is transferable. Other currency comes in the form of Crown Notes (see sample in the back of the sourcebook). This paper money is often used when dealing with large sums of Crowns. Only a Moneylender of the Silver Guild can issue a Crown Note and only a Moneylender can cash a note. The notes are designed, like our modern day traveler's checks, that only the person for whom the note was written can exchange it for actual Crowns. Though Crown Notes can be stolen from a character, they are difficult to cash and thus are one way to safeguard money. Player-characters begin the game with 50 Crowns but through adventuring, the character may earn or find additional money. Money should always be carried or stay in-play and should not be kept at home or in the car. The only way to legally take money out-of-play is to deposit it with a Moneylender, usually an NPC or played by Elder of the Realm. The days of the month are simply named for their number. For example, July 30 would be the Thirtieth Day of Highsummer. A full list of the Archaean feast days and holidays can be found in the full version of the Archaea Sourcebook. The Age of Heroes burns like a bright flame in the minds and hearts of all Archaeans. The heroes of lore have become an important part of the Realm's culture providing inspiration, guidance, and hope for all that know the epic stories. The reverence for heroes, as well as elders and ancestors, centers on the idea that enlightenment and wisdom can be gained through the understanding of, learning from, and respect for the past. A full list of the Archaean heroes can be found in the full version of the Archaea Sourcebook.